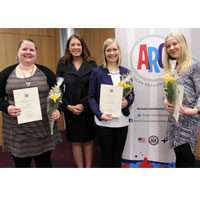 The U.S. Embassy Finland hosted the winners of the 2017 American Resource Center (ARC) Grant 2017 at a ceremony in the Embassy’s Innovation Center on May 21, 2018. The U.S. Embassy awarded a record number of four ARC Grants this year due to the exceptionally high quality of applications last fall. More images of the ceremony are available at the ARC’s Flickr album. Since 2006, the ARC has managed this grant program for Finnish university students, who are working on a Master’s thesis concentrating on the United States. So far, 22 students have received the award. Assistant Public Affairs Officer Jeanie Duwan had the pleasure of congratulating the ARC Grant 2016 winners at the Kaisa library on May 11, 2017. 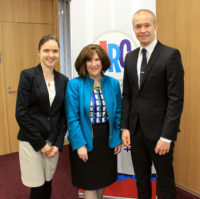 The American Resource Center has been running its successful grant program for Finnish university students who are working on their Master’s thesis that concentrates on the United States since 2006. So far, 18 students have received the award. 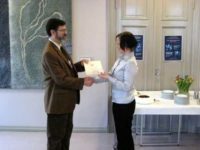 American Resource Center Grant 2015 awardees were celebrated at the ARC 70th Anniversary Seminar at the Helsinki University Kaisa Library on May 19, 2016. We were proud to present certificates to the 2015 ARC Grant winners Juuso Koskinen and Evelina Salo. Mr. Koskinen studies at Turku University, and the working title of his Master’s Thesis is “Anchor for Neutrality – United States Role in Finnish Foreign Policy 1980-1990.” Ms. Salo studies at Åbo Akademi University and the working title of her Master’s Thesis is “’I am in Here: David Foster Wallace’s Investigation of Mind and Self.” Congratulations! This year marks the 10th Anniversary of the ARC Grant program. So far 15 Finnish students have received a scholarship from the ARC. The next application period will start in September 2016. A total of 14 applications were submitted for the ARC Grant 2014. The competition was nationwide – students from six universities across Finland submitted their applications, and it attracted interest from a wide variety of academic programs. The applications covered a wide variety of subject matters including political science, cultural history, the English language, and social science. The winners for the ARC Grant 2014 were chosen by Mr. Jeff Reneau, Counselor for Press and Cultural Affairs (U.S. Embassy), Ms. Jeanie Duwan, Assistant Public Affairs Officer (U.S. Embassy), and Ms. Terhi Mölsä, Executive Director, Fulbright Center. The ARC Grant program has awarded students working with their Masters since 2006, and the next application period will start in September 2015. 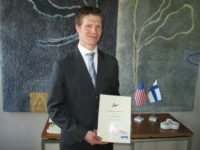 Public Affairs Officer Jeffrey Reneau and Executive Director of Fulbright Center Terhi Mölsä presented the annual American Resource Center award of 1,000 Euros to Panu Kontkanen on April 16. The ARC grant was established in 2006 and it is applicable to Finnish university students, who are currently working on a Master’s Thesis on a United States related topic. The ceremony was an excellent start to the last lecture in series of “Windows to Iconic America” for both the winning thesis and the topic of the lecture covered the themes on religious traditions of Native Americans and especially the sweat lodge tradition. A total of 16 applications were submitted for the 2012 ARC grant of 1000 Euros. The selection committee was captivated by the originality, diversity, and the academic quality of the topics and applications. The competition was nationwide – students from seven universities across Finland submitted their applications, and it attracted interest from a wide variety of academic programs. The applications covered a wide variety of subject matters including history, the English language, law, political science, North American studies, literature, cultural history and church history. 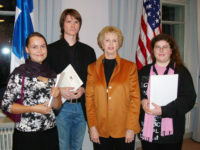 After lengthy deliberations, the committee members – Mr. David McGuire, Counselor for Press and Cultural Affairs (U.S. Embassy), Ms. Amy Hirsch, Assistant Public Affairs Officer (U.S. Embassy), and Ms. Terhi Mölsä, Executive Director, Fulbright Center, selected Suvi Karila as this year’s winner. The American Resource Center announced the competition in September 2011, and a total of 24 applications were submitted for the 2011 ARC grant of 1,000 Euros. The selection committee – Ms. Marjut Robinson, Mr. David McGuire, Press Attaché (U.S. Embassy), and Ms. Terhi Mölsä, Executive Director, Fulbright Center, praised the high quality of the submissions. The applications were received from the universities of Oulu, Vaasa, Jyväskylä, Tampere, Turku, Helsinki, Åbo Akademi and Eastern Finland. The applications covered many subject areas, e.g. journalism, comparative religion, social research, political science, history, the English language, education, North American studies, and international relations. The ARC Grant ceremony took place as a part of the America in Living Color Seminar co-organized by the North American Program at the University of Tampere and the Fulbright Center. 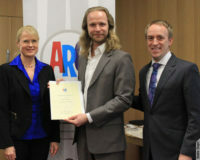 The U.S. Embassy’s Counselor for Press and Cultural Affairs Marjut Robinson announced the 2010 award recipient of the American Resource Center grant in the America in Living Color Seminar in Tampere on March 11. The ARC announced the competition in September 2010, and a total of 30 applications were submitted for the 2010 ARC grant of 1000 Euros. The selection committee of three members—Ms. Marjut Robinson, Counselor for Press and Cultural Affairs (U.S. Embassy), Mr. David McGuire, Public Affairs Officer (U.S. Embassy), and Ms. Terhi Mölsä, Executive Director, Fulbright Center—selected the winner. The committee members were very pleased with the high quality of the applications. The members also noted with satisfaction that submissions were received from nine different universities throughout Finland on such diverse topics as sociology, forest ecology, political science, pharmacy, history, the English language, sociology, and journalism and communications. 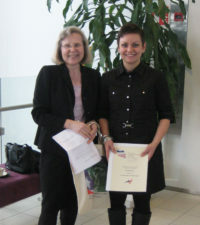 The ARC Grant ceremony took place as a part of the America in Living Color Seminar co-organized by the North American Program at the University of Tampere and the Fulbright Center. Counselor for Press and Cultural Affairs Marjut Robinson delivered Embassy’s greetings to the seminar participants and presented the award certificate to the scholarship winner. The American Resource Center announced the competition in September 2009 and a total of 18 applications were submitted for the 2009 ARC grant of 1000 Euros. The Jury praised the excellence of the submissions and noted that the academic quality and originality made it very difficult to select one winner from the entire group. Jurors noted that this year’s applications came from throughout Finland and covered such diverse subject areas as theology, political science, automation and systems technology, history, the English language, sociology, North American studies, international relations, and communications. The jury members, Ms. Nicole Conn, Counselor for Press and Cultural Affairs (U.S. Embassy), Mr. Michael Butler, Deputy Chief of Mission (U.S. Embassy), and Ms. Terhi Mölsä, Executive Director, Fulbright Center, selected Tuomas Koskenniemi as this year’s winner. Mr. Koskenniemi presented his research plan profoundly and clearly, and he convinced the jury about his capability to conduct this truly interesting and challenging research project. A total of 16 applications were submitted for the 2008 ARC grant of 1000 Euros. The jury was truly impressed by the originality, diversity, and the academic quality of the topics and applications. The competition was nationwide – students from five university cities and towns across Finland submitted their applications — four applications came from the University of Helsinki, the University of Turku, and the University of Jyväskylä; and one from the University of Oulu, the University of Tampere, the Helsinki School of Economics, and the Åbo Akademi. The applications covered a wide variety of subject matters including history, the English language, law, political science, North American studies, international relations, ethnology, and economics. 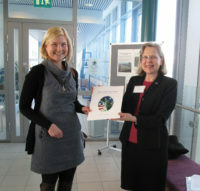 Susanne Setälä from the Department of English at Turku University received the American Resource Center grant on February 20th. 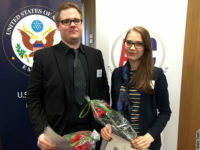 The annual grant is intended for students of Finnish nationality, enrolled at a Finnish university, who are working on a Master’s thesis on a topic related to the United States. The grant was established in 2006 to celebrate the ARC’s 60th anniversary. Susanne Setälä’s Master’s thesis deals with African-American poet Lucille Clifton. Its working title is A Poet of Her Own Faith – Lucille Clifton and the Remaking of Christianity. The scholarship ceremony was arranged as part of the African American History Month, which is celebrated in February. 14 applications for the ARC grant were received by the closing date September 30, 2006, and the jury was impressed and delighted by the originality, diversity, and the high quality of the topics and applications. The first prize 1,000 € scholarship was awarded to Ms. Anni Sams from the Department of Sociology at Helsinki University with a Master’s thesis working title of Transnationalism, Global and Local Economies, and Cultures of Nationality Among the Cuban Immigrants in Miami. 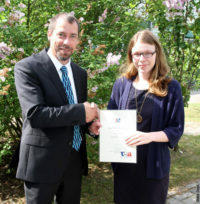 Additional 500 € scholarships were awarded to Ms. Petra Helenius from the North American Studies Program at Helsinki University with a Master’s thesis working title of Get Onboard to Underground Railroad, from Southern Louisiana up to Canada – Midwestern Route and its Importance in 1830’s – 1860’s and Mr. Pekka Jääskeläinen from the Department of English at Helsinki University with a Master’s thesis working title of Culture-Bound Problems in Translating Religious Aspects of “Narrative of the Life of Frederick Douglass, an American Slave” into Finnish.